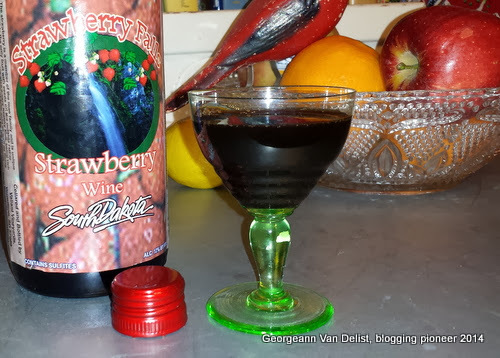 Over the weekend I finished a bottle of exceptional strawberry wine from South Dakota, and now I must wait until summer to go back for another! If I had known it would become a favorite after dinner sipping wine for cold evenings, I would have purchased at least one extra bottle to tide me over until June. My husband and I found a new tasting room on a driving tour through the Black Hills. I cannot remember the name of the place, but we never drive past a winery or tasting room without stopping! We stayed an hour, chatting with the friendly stewards and sampling everything, then left with several bottles, among them a tart rhubarb (popular in South Dakota), a classic made of wild grapes harvested locally, and the fun looking strawberry. I planned to do something ambitious with it since I don’t typically sip ultra thick sweet desert wines. It didn’t take long for the strawberry wine to convince me that we were meant to be: flawed mortal flesh loves fruited whimsy served in a glass! I poured the tiniest serving on Christmas Eve, and after sipping it demurely I poured a second glass and sipped it greedily. On Christmas Day I thoroughly enjoyed a larger glass. The wine and I made each other very happy for exactly one month, until I poured my last glass and sipped the final jammy remnants wistfully. I think about how long it will be before I’ll have another bottle. We will be on our summer vacation in South Dakota, I will be on a mission to fill my car with strawberry wine! My wine puddle before I resorted to using a straw. 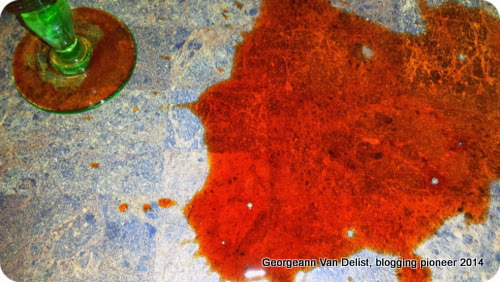 While pouring my final (sob) glass, I misjudged how much wine remained in the bottom of the bottle, and it overshot my port glass, leaving a huge blood red puddle on my counter. Nooooo! I wasted a giant sip! Our house guest suddenly strolled into the kitchen and witnessed me sucking wine off the counter with a plastic straw. He was speechless at my desperation, probably thinking: some people will do anything for wine. Sipping the strawberry wine was like indulging in homemade preserves, but with the benefit of them being spiked by a sinful hand. Jammy and full bodied, heavy on the tongue, with a slight tang to offset the pushiness of the sweet strawberries. It paired impeccably with cheeses, any cheeses we could imagine! I liked to pair it with goat cheese, which has a distinct funky flavor, but it also paired beautifully with cow’s milk cheese, particularly sharp, aged, or even sweet and creamy cheese. Oh, it was a fine accompaniment to noshes! Until I can be reunited with a new bottle, my strawberry wine will be (sweetly, not bitterly) missed. 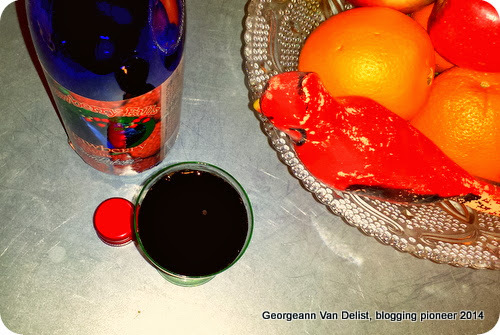 This entry was posted in Anecdotes, My Kitchen and tagged Black Hills, desert wine, fruit wines, South Dakota, South Dakota wines, strawberry wine, Wine, Winery on January 27, 2014 by Georgeann. Good old Kansas hospitality means a neighborly delivery of delicious smoky BBQ! Sometimes I think my neighbors can read my mind. After several hours of house chores I suddenly found myself without plans for lunch. The girls were tired, cranky, and hungry. I needed to put together a tasty lunch immediately! I had no idea what to fix, and was standing in the kitchen staring absently into the pantry when the doorbell rang. I came face to face with the next door neighbor’s son, who was holding a sooty aluminum pan half full of smoldering BBQ. Real barbequed pork, slow smoked in a back yard on a sunny Sunday! Jackpot! I took the pan to my stove and peeled back a little of the foil. The slab of pork was caramelized to a black chewy crust on one side, still hazy pink on the other, and emanating a sinful smoky scent. I teased a few obliging strands of the still warm meat from the slab with a small fork and had a taste. It was charred heaven! I fashioned a light lunch of pulled pork sandwiches with BBQ sauce, toast, mayonnaise, and homemade pickles on the side. Each bite was a perfect marriage of wanton texture and complexity of flavor. Even my daughters, who had refused to eat almost everything all day due to illness, were delighted to have a plate of BBQ smothered in zesty sauce for Sunday dinner. There is something both humble and luxurious about having a meal of BBQ on a sunny afternoon. I sent my neighbor a text message thanking her for reading my mind and spoiling us with a truly delicious treat. It isn’t often that one is blessed with such generous neighbors, people who would share so thoughtfully. We truly have the kindest and best neighbors anyone could ask for. 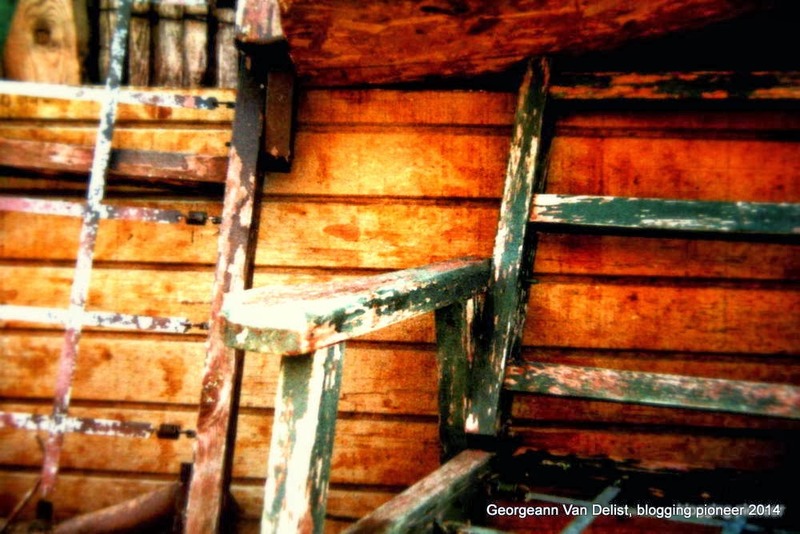 This entry was posted in Anecdotes, My Kitchen and tagged Barbecue, BBQ, Cooking, Food, Neighborhood, Neighbors, Neighbors helping each other, Pulled pork, Sharing food with neighbors on January 19, 2014 by Georgeann. Ever have one of those days, when only food will soothe an aching soul? Well, today is definitely one of those days. Today is a comfort food day. If you hadn’t noticed — and it is perfectly fine if you hadn’t — I have been absent from WordPress for most of the week. There are two reasons for this absence. I had a massive head cold that left me totally incapable of typing anything remotely lucid (seriously, what does “nacho cheese hot tub” in my blog notes mean?). I also got “locked out” of my WordPress account when Google Chrome seized up. This turned out to be a simple fix (I think) because after a visit to the Geek Squad at Best Buy, it seems that things are back on track, and here I am. 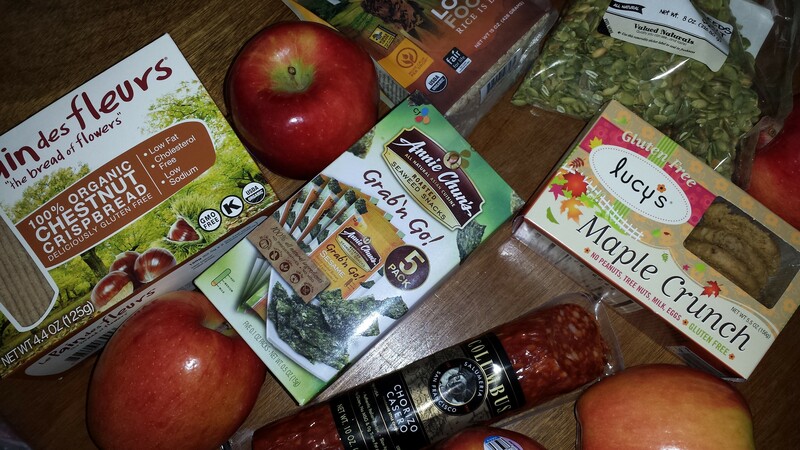 An assortment of comfort foods: Pain des Fleurs crispbread, Lotus Foods rice, roasted pumpkin seeds, Lucy’s cookies, Annie Chun’s seaweed snacks, Columbus Chorizo Casero, and Braeburn apples. I spent most of the week feeling miserable and cranky, sleep deprived and a bit starved for good old comfort food. It is no fun to have a cold, but not being able to write was unbearable! Today my family braved the indecisive Kansas weather to solve my computer problem and run several other errands. In the course of the day it has been sunny, rainy, frigid, windy, muddy, and icy, sometimes all at once. When the wind plasters your hair into your eyes and splatters pellets of freezing rain all over your nice shopping ensemble, at least you can console yourself with the thought of getting a hot meal somewhere safe from the nasty elements. One of the treats my husband had planned was a stop at the Hy Vee grocery store. 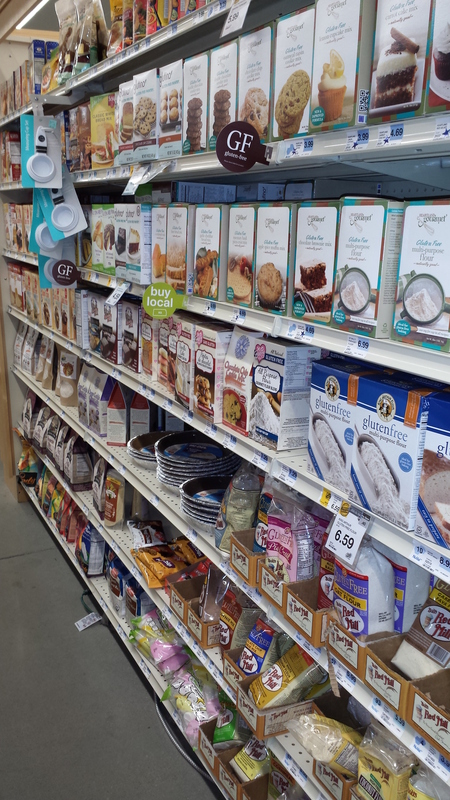 This gesture might not seem like much, but for someone with gluten and dairy intolerance, the store’s Health Market, a section dedicated to organic, allergen free, and diet specific foods, makes shopping less terrifying. It is a haven for those of us who might otherwise have a difficult time shopping for “safe” foods. After a rough week I needed a heaping bowl of comfort food and a simple means of delivery! For a few minutes I just wandered, absorbing new product lines, trying to memorize brand names and ingredients for recall later. 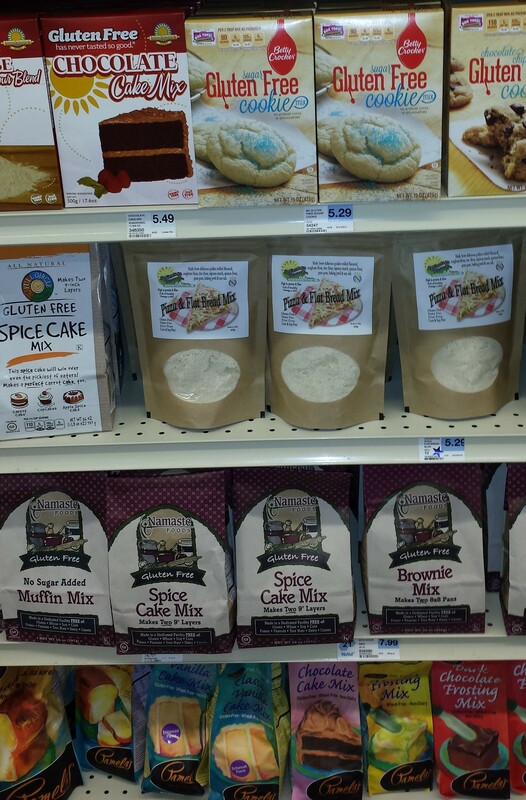 I tried not to impulsively grab gluten free goodies because they tend to be expensive and they can also be quite refined. ‘Gluten free’ does not automatically mean the products are healthier than snacks containing grains with gluten, as I have learned over the year. So I browsed carefully, passing over things I’ve tried before, looking instead for items of special significance. 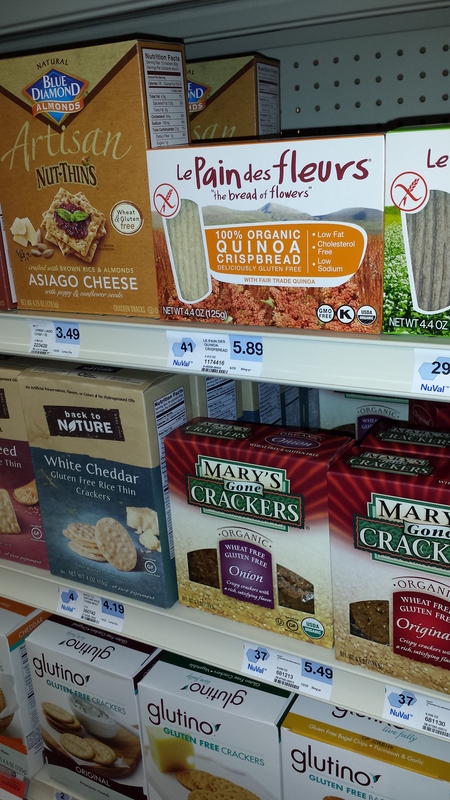 There are so many delicious gluten free crackers to choose from now! A few items caught my attention today. First, a box of French crackers made from chestnuts brought a smile to my face. Hello old friend! The texture of the Le Pain des Fleurs crispbread is so light and delicate that they must be handled with care, but they are wonderful drizzled with a bit of oil or a dab of jam and served with tea. Next I spotted a bag of roasted pumpkin seeds, a perfect portable snack inside my hobo bag. I discovered a cheerful red gluten and MSG free chorizo, something I have been wanting but unable to find in grocery stores in my town. I plan to fry thin slices in oil (a trick I read about in Saveur), and also add bits of the chorizo to Sunday morning Migas. Apples are a staple for our family, and I never visit a store or farm without buying at least a small bag. I did just that before we visited the Health Market one last time so my husband could look at bulk spices. I grabbed a box of seaweed snacks for my daughter’s lunch box. She is addicted to these crispy little delights and will eat the entire box if I don’t hide them from her! Finally, I finished my spree with a tiny bag of volcano rice (because we have never tried it before) and a box of Lucy’s gluten free Maple Crunch Cookies (because they are 50% off and I always need cookies). Feel like baking? There are no limits in the gluten free kitchen! I normally feel a bit guilty about buying gluten free items because the price seems to create an illusion of extravagance that outweighs the health benefits of the products. Today, knowing the items I chose would (mostly) be shared with my family made me feel happy; I decided that making good decisions and giving us something more exciting to eat is never a bad thing! The afternoon was rounded out with a pleasant lunch at a favorite local eatery. I felt a rush of anxiety as I scanned the menu for gluten free options and saw nothing noted. The waiter told me that while the restaurant did not technically offer gluten free options, the kitchen staff would be happy to make adjustments as needed. That sounded promising, and the staff followed through on what turned out to be a lunch of divine comfort food. I normally turn up my nose at rare steak, but I was served a Chili Steak Burrito Bowl (minus the Burrito part) with bits of steak that melted in my mouth. It was exactly the fortification I needed after a long week of bland toast, weak tea, sticky rice, and icky Kleenex. A glorious nap after coming home followed by two of the Lucy’s cookies crumbled over dairy free Almond Dream ice cream, and I am feeling like myself once again. My stomach is happy, my head feels clear, and my blog is back in business! Things are looking up. …Except now my kids are running fevers, coughing, and blowing their noses. I guess we can’t have it all. Going Gluten-Free is NOT A DEATH SENTENCE! This entry was posted in Daily Thoughts, Discoveries, My Kitchen and tagged affordable gluten free foods, challenges of gluten free lifestyle, Comfort food, comfort food for people with food allergies, comfort foods, finding gluten free snacks at the local grocery store, Food, gluten free, Gluten-free diet, Health, looking for gluten free snacks, Special Diets on January 18, 2014 by Georgeann. 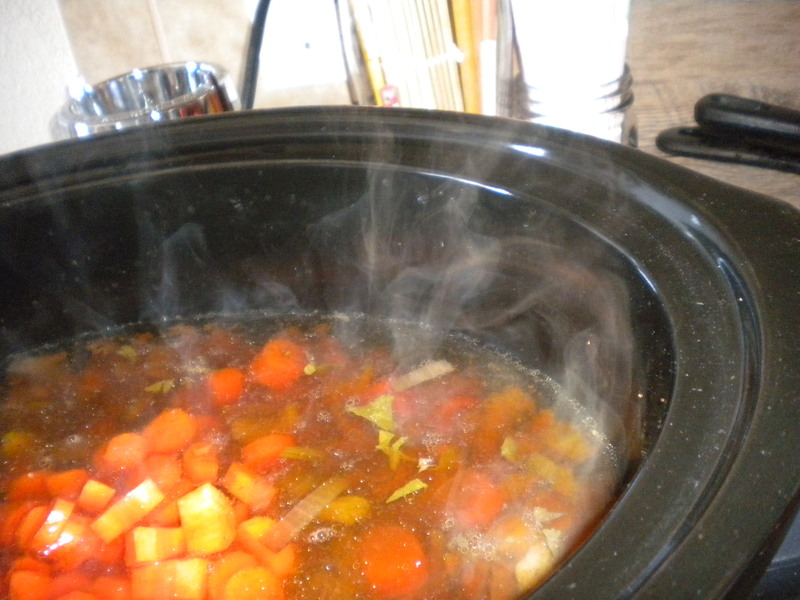 Homemade deer venison and root vegetable crockpot stew, always a hit! Trying to be more creative in the kitchen has been one of my goals lately, and it even might be one of my New Year’s resolutions. Keeping my family happy with food is a full time job, so it seems like I am always in the kitchen or at the grocery store, and if I am not in either of those places, I am probably thinking about what I am going to cook, and writing a never ending shopping list. The biggest challenge is not simply cooking; it is concocting something that everyone actually likes. When I cook, there is a 25% chance that someone will hate my cooking, and there is a 50/50 chance that someone will be one of my daughters. 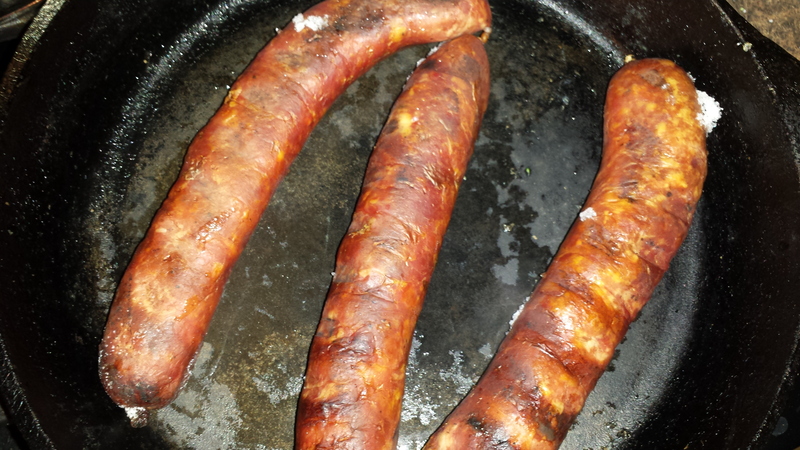 Homemade Kielbasa. Nobody in our family turns these down! Good advice, because my mother-in-law is a smart cookie, but this is also easier said than done. If she saw my house right now she would probably decide that for me note taking should be a lower priority than basic domestic hygiene. Also, I rarely cook following actual recipes unless I am trying something new and unfamiliar, and even then I improvise, substitute ingredients, and experiment, sometimes wildly, because I often second guess the recipes. “Yeah, Julia Child probably knows what she’s talking about, but I’m going to go ahead and put basil in anyway…” I do also tend to make dishes up using leftovers and random ingredients, creating resourceful and rustic meals that, like unicorns, only appear once in our lifetimes, astound us, and then disappear never to be recreated. 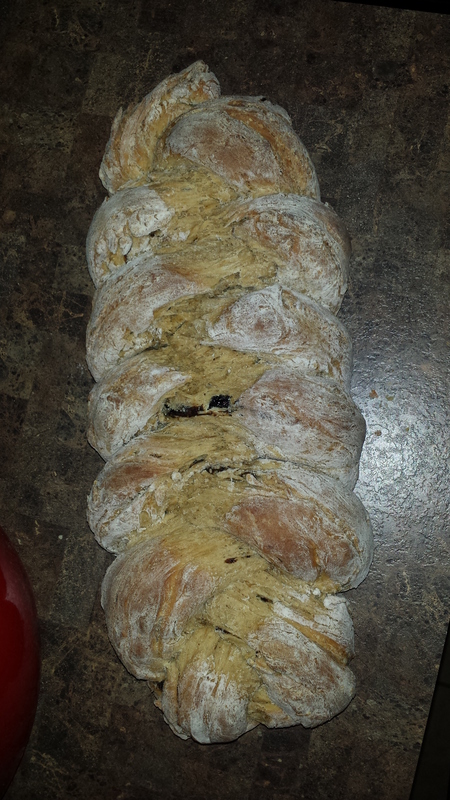 Braided bread — gorgeous, epic fail. When I do make my special creations, like I did yesterday using my husband’s leftover homemade breakfast sausage (with his secret spice blend), some broccoli rescued from the Wal-Mart produce section, and the last of my Asian oils and sauces, I can always count on one child to be excited and one to be grossed out. I was dumping sauces into my stir fry and then tossing the empty jars into the trash, delighted to be cleaning out the fridge! But how would the lunch taste? It turned out pretty great, but I had my 25% failure rate with one child refusing to eat. Tonight I concocted a Mediterranean dish with chicken, green olives, tomatoes, and other things that I knew the girls would hate. It was really fun to make, and I danced around the kitchen to Guns n’ Roses while I added the ingredients to the bubbling pot. Oh what the hell. Back to the same old boring menu plan. Bring on the tacos and spaghetti sauce. 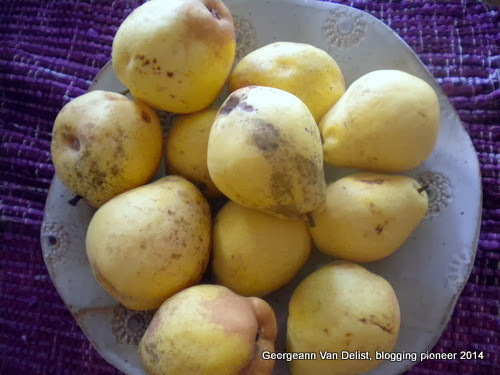 This entry was posted in Anecdotes, My Kitchen and tagged being more adventurous in the kitchen, Cooking, cooking challenges, cooking for picky eaters, cooking for your family, cooking with leftovers, following recipes, getting children to eat home cooking, Home, home cooked meals on December 30, 2013 by Georgeann. I haven’t actually written any posts specifically about my food sensitivities so I guess today is as good a day as any to come out of the food pantry, carrying the beautiful gluten and dairy free cake I baked for my husband’s birthday. 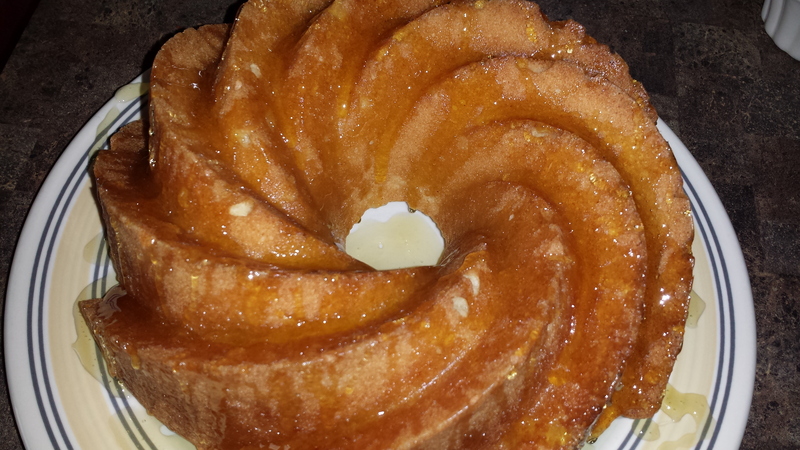 Gluten Free Almond Cake drizzled with honey. I really wanted to bake a delicious cake for Van, but it had to be a cake my whole family could enjoy. In my kitchen, gluten, dairy and peanuts are the enemy; one of my daughters has already been diagnosed with lactose intolerance like me (you are welcome, Darling). So I found a recipe while shopping online for King Arthur Flour products. The link to the site is at the end of my post if you become interested in baking this cake. I did change a few ingredients to make the recipe dairy free and also more, shall we say appealing, to my sometimes critical eaters. Spiral Bundt pan, greased with Crisco and ready for batter. 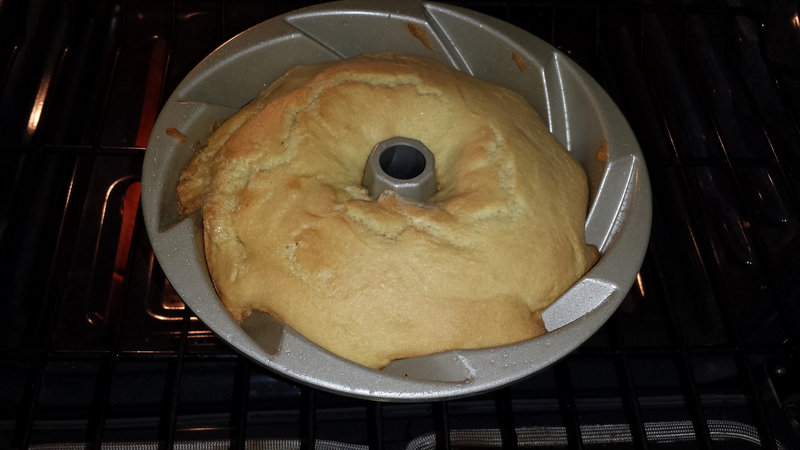 I greased the Bundt pan liberally with Crisco because of paranoia that the cake would stick to the pan and I would end up with a huge mess, resulting in my crying and pouting for the rest of the day. The gluten free cake batter going into the oven. Nice and fluffy and golden. Hallelujah! It turned out! I can’t believe it! I think the Crisco shortening was the key to keeping things slippery enough for the cake to pop out. Whew! 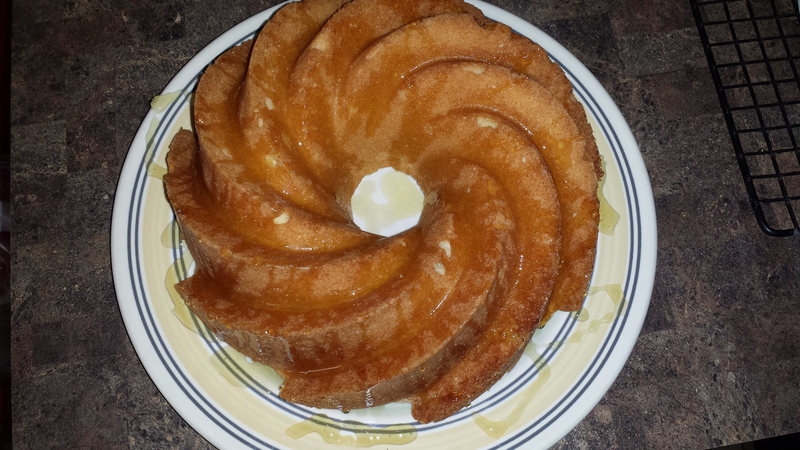 I did not follow the instructions for the glaze, but instead I drizzled honey over the cake while it was still warm. 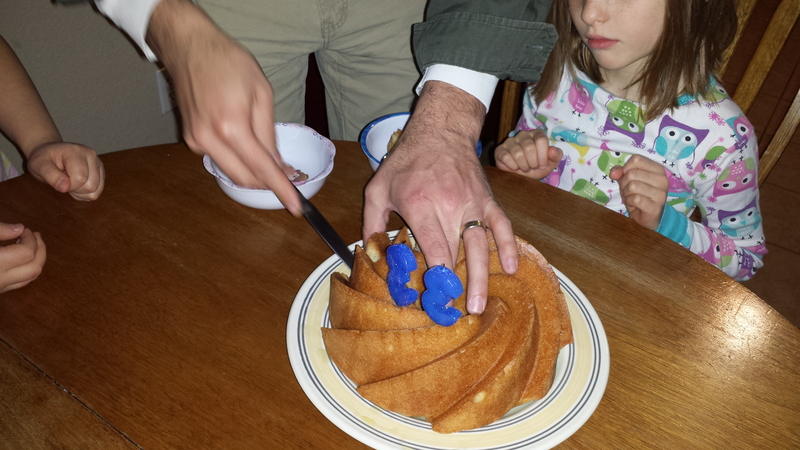 I did make a pseudo-frosting/whipped spread for my husband to put on his cake slices. The recipe is below. 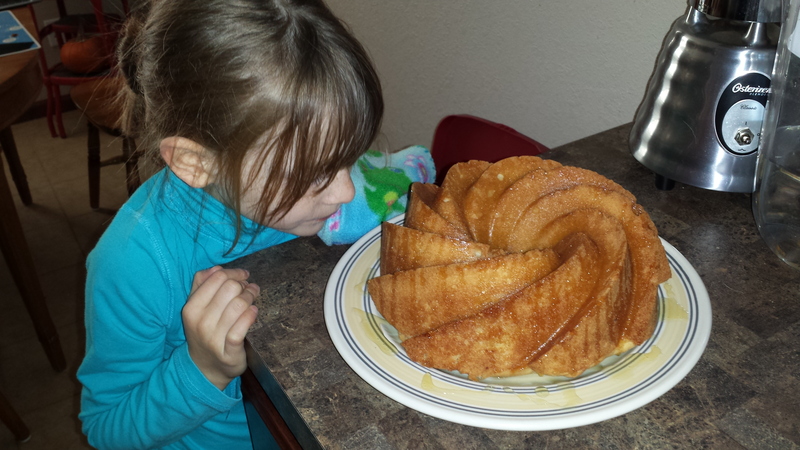 My daughter inspecting my culinary work. 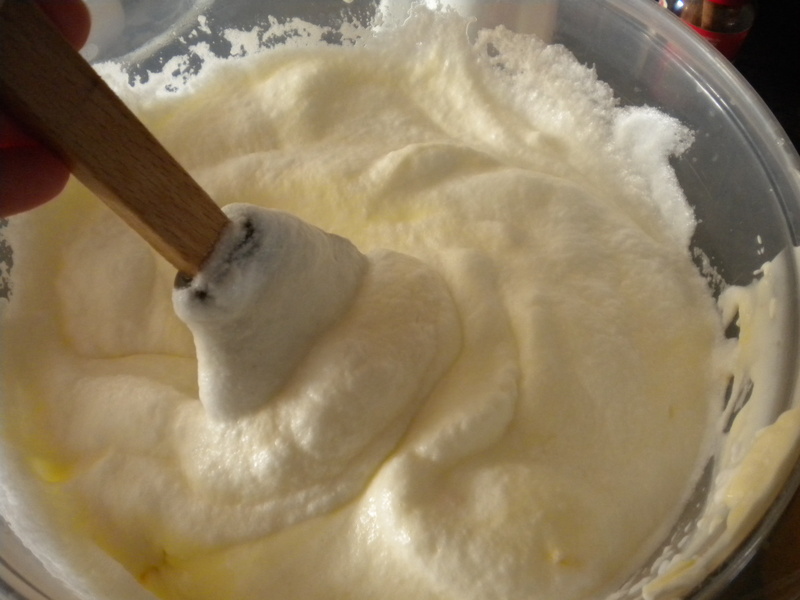 Whip the ingredients together in a mixer on high speed until a fluffy frosting has developed. This frosting will be mildly sweet, and if you want to add more sweetness or make a stiffer frosting, you can add powdered sugar by Tablespoons until you have the desired consistency and sweetness. This is basically a very fluffy cream cheese spread, so keep it refrigerated and use it on anything you can imagine! Note: If you add powdered sugar to your frosting, it may not be gluten free. Some powdered sugar does contain gluten, so check the label! 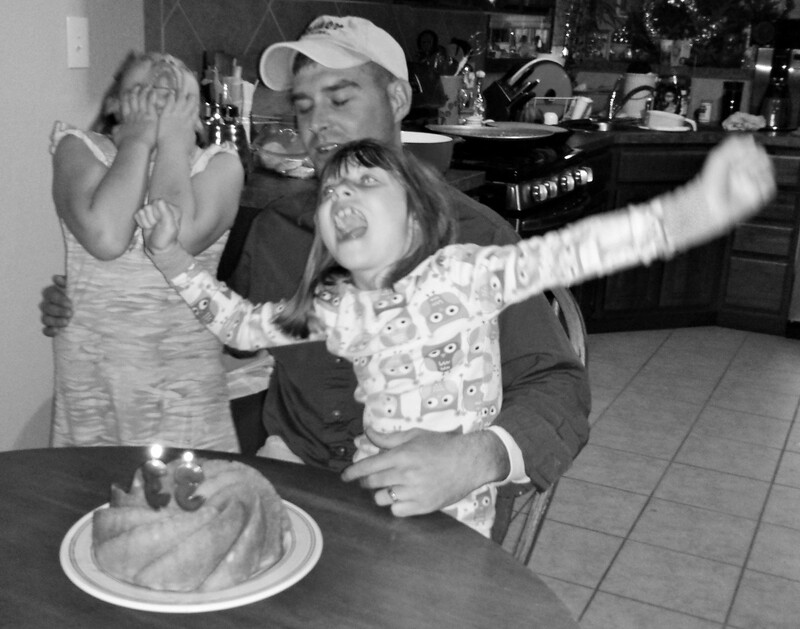 Singing the birthday song. Quite possibly the worst — and best — picture ever! Cutting a slice of birthday cake. This cake turned out to be delicious! If you are interested in trying this recipe, follow the link to the King Arthur Flour site. This entry was posted in My Kitchen and tagged best gluten free baking mixes, Bundt cake, fancy cakes, festive gluten free baking, gluten free baking, gluten free cakes, gluten free holiday baking, Holiday baking, King Arthur Flour, using gluten free baking mixes on December 29, 2013 by Georgeann. If you are considering making a cheesecake for the Holidays but have never tackled this daunting task, I will let you in on a little secret. 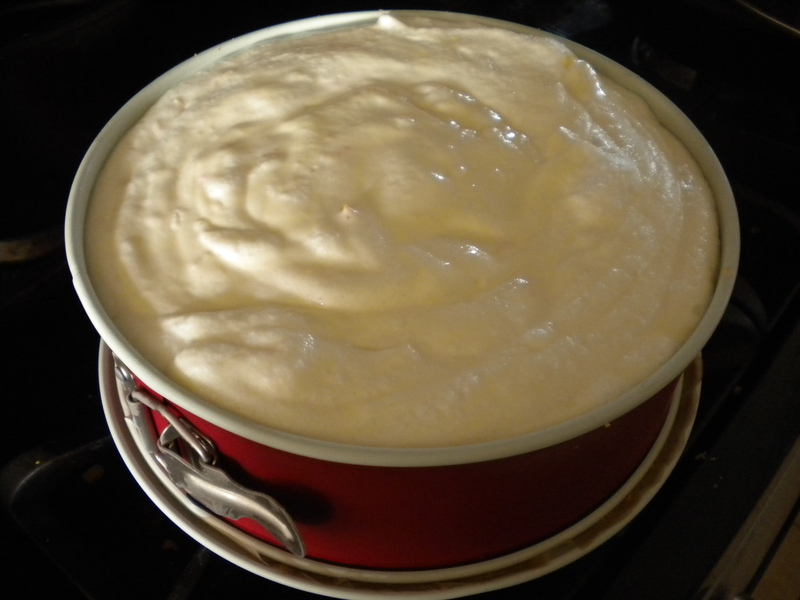 Making cheesecake, while time consuming and details oriented, is extremely easy! I first encountered this revelation a few years ago when my father decided to have a benefit auction to help a friend diagnosed with cancer. Looking around my house, I realized that we had neither valuable items worth donating nor sufficient funds to throw into the kitty. Like many housewives faced with this type of dilemma, I baked. A novice with no idea what I was doing, I managed to produce four massive cheesecakes and three rhubarb pies, and to my surprise, they sold like hotcakes (pardon the pun)! Back to you (yes, YOU) making an actual cheesecake. If you really want to do this, FIRST READ THIS ENTIRE POST. It will take time to read this, but before you start mixing ingredients you have to be 100% committed to this project! It takes at least two hours but it’s worth it because this is the best cheesecake you will ever make. 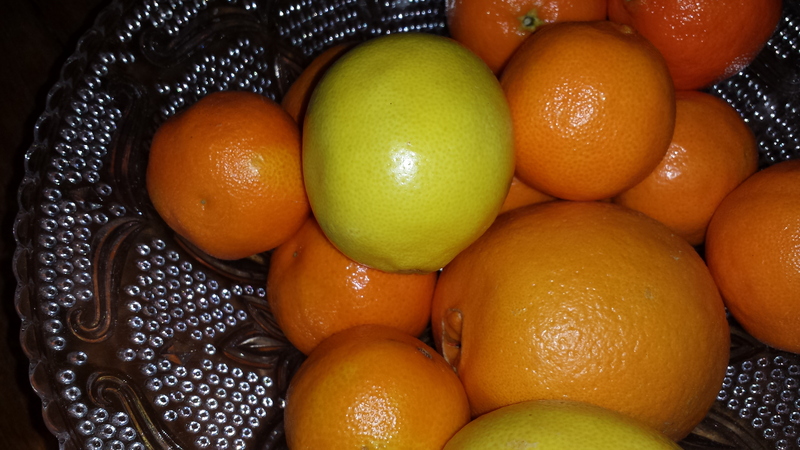 Citrus is what makes a cheesecake really tasty! I can’t take credit for this recipe because it came from The Fannie Farmer Baking Book, copyright 1984. However, I have adapted the recipe to make it well, better. While the Fannie Farmer version calls for a sweeter cheesecake, I prefer more complex spices, citrus, and berry notes. The ingredient list that I use is annotated below, with the Fannie Farmer version in parenthesis and Italics. These measurements will produce a cheesecake in an approximately 12 inch springform pan. Depending on the type of cheesecake, you can get really creative with fun extras. If you want to make a plain cheesecake as your prototype, the ingredients listed above are all you need. If you want to be adventurous, here is another list of just a few ideas to try. Dried cranberries, cherries, blueberries, etc. 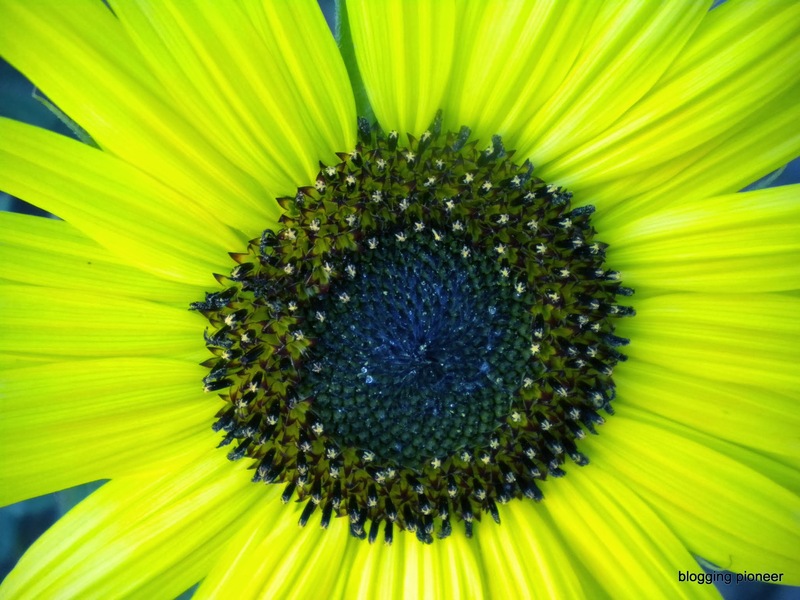 *If you are adding any of these fun extras, you will naturally end up experimenting a bit. I like to add nuts, dried fruits, and fruit spreads directly to the crust before adding the cheesecake mixture, but you may find a technique that works better for you. If using a powder such as the espresso powder, mix that directly into the cheesecake mixture or the chocolate when you melt it. Speaking of the chocolate, you didn’t think I forgot about that, did you? See Step 5-A for the chocolate marble variation. Make sure you have the right gadgets before you begin! If you are still interested in tackling this project, remember that it is easy and keep reading through the steps before you begin baking. STEP 1: Make sure all dairy products and eggs are at room temperature. Trace the bottom of the springform pan onto wax paper and cut out the circle, then put the paper into the pan. It will settle and stick once the crust is formed into the pan. STEP 2: Put graham crackers into a gallon sized plastic zipper bag and use a rolling pin to crush them into fine crumbs. You may need to sift out the finer crumbs through a colander into a mixing bowl. 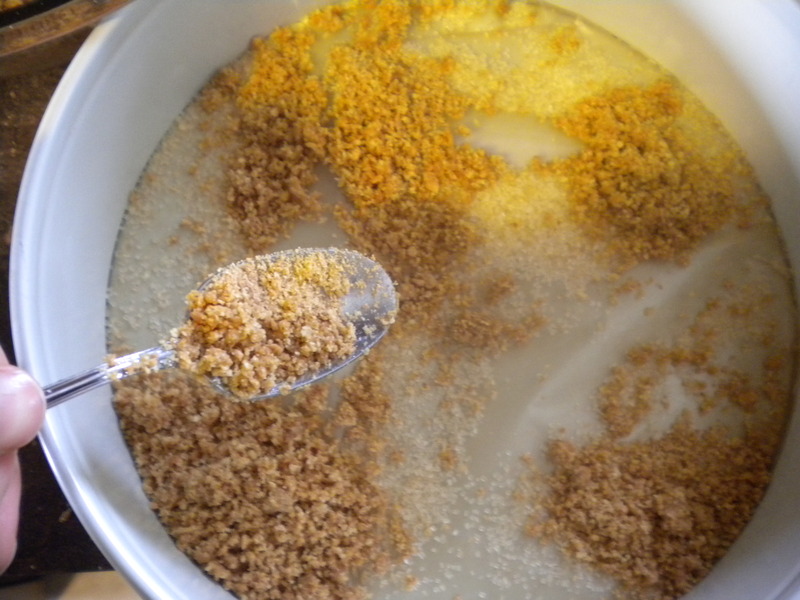 STEP 3: Combine the crumbs and sugar with a fork in a medium mixing bowl, then add the melted butter and continue to mix. The mixture will become moistened and slightly sticky. Using a large spoon or spatula, press crumbs into the bottom of the pan and about 1 & 1/2 inches up the sides to form the crust. 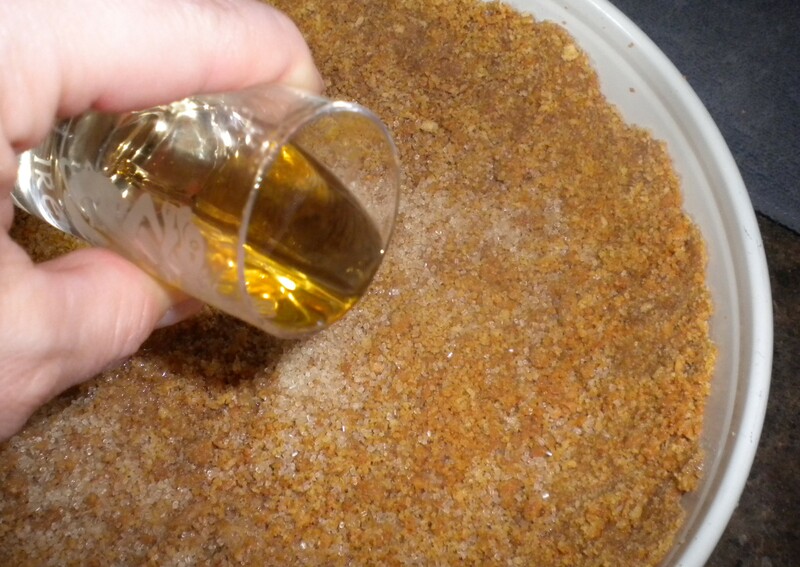 Pour about one half shot of Drambuie into a shot glass and sprinkle sparingly over the crust (optional). Set pan in the freezer while you prepare the remaining ingredients. 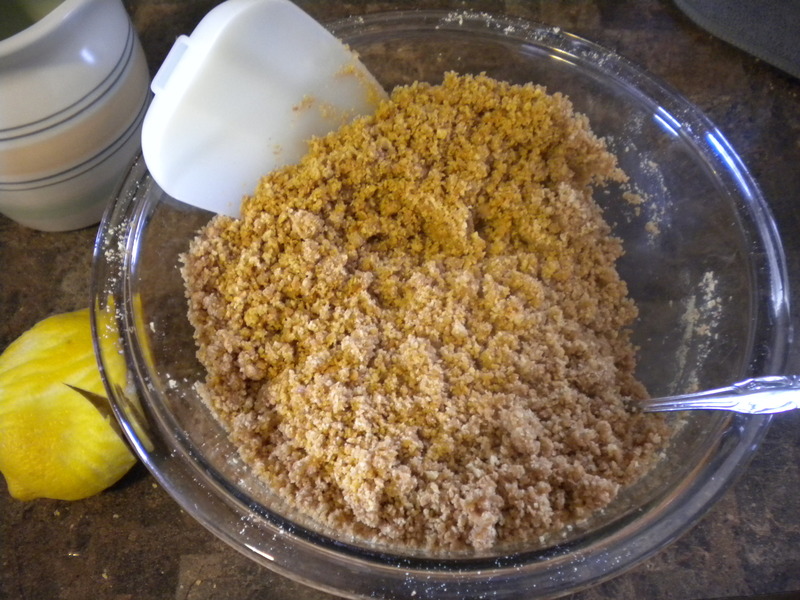 Graham cracker crumbs mixed with melted butter and granulated sugar. Sprinkle the crumbs by spoonfuls into the pan and press until firm. 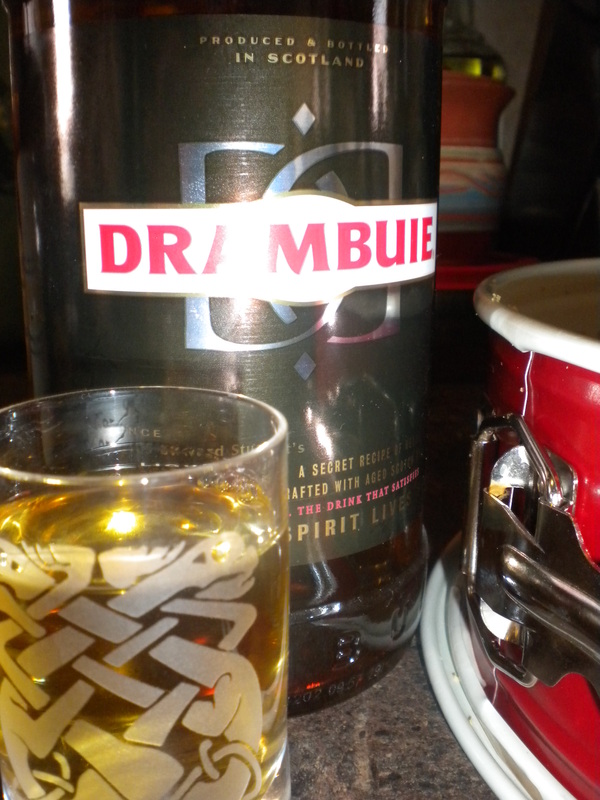 A bit of Drambuie sprinkled over the crust gives it a unique and unforgettable flavor! I also added large granulated sugar sprinkles. If adding festive ingredients to your cheesecake, a layer directly on the crust is a must! 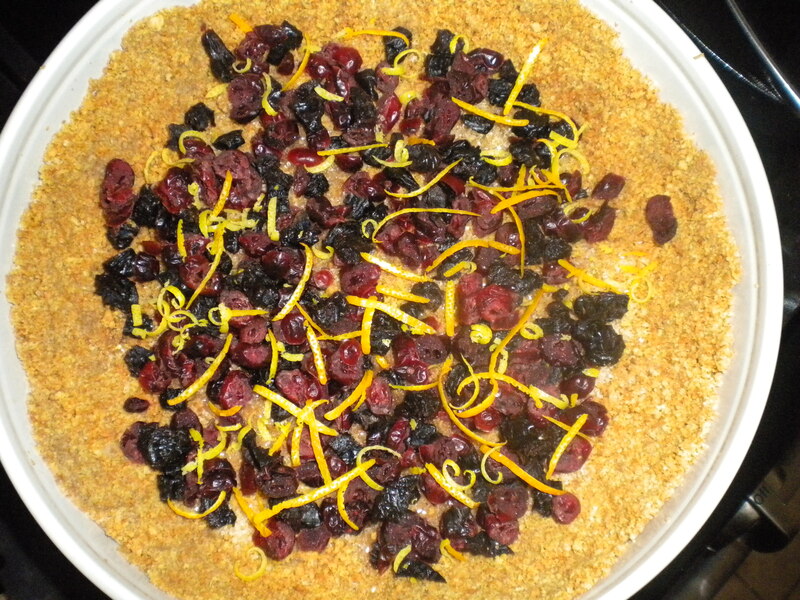 I added dried cranberries and cherries as well as lemon zest. STEP 4: Preheat oven to 325 degrees. 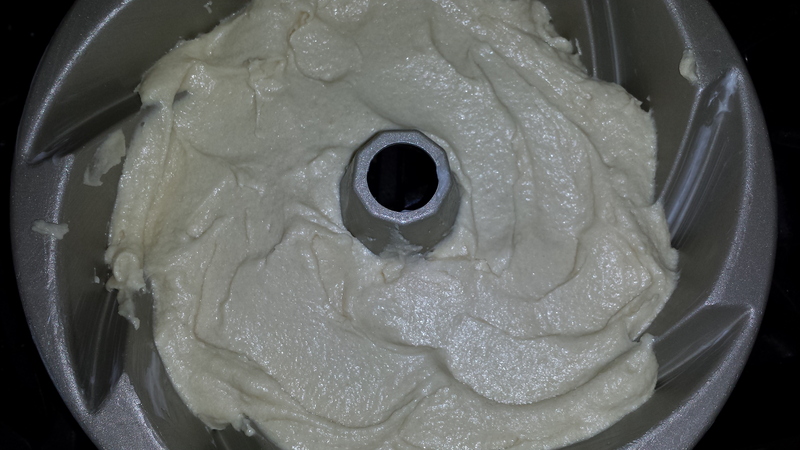 In the stand mixer, beat cream cheese on high speed until it is fluffy. Add 1/2 C of the sugar (if following Fannie, add 3/4 C), hold back remaining 1/4 Cup. Beat until cream cheese and sugar are well mixed. Add lemon zest, salt, flour and vanilla, according to which recipe instructions you are following. Beat until ingredients are well incorporated. Beat in egg yolks (no egg whites) at medium speed, then add sour cream and lemon juice and beat at low speed until the batter is smooth. 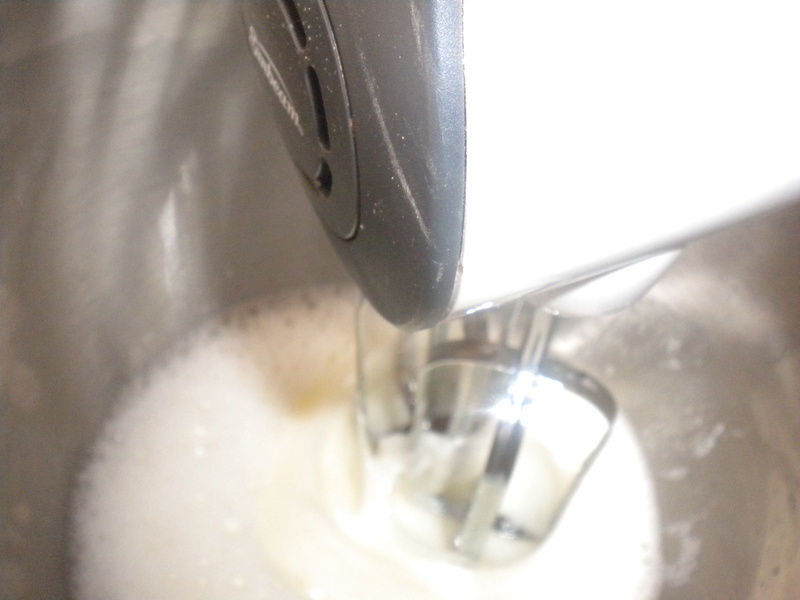 STEP 5: In a separate large mixing bowl, combine the egg whites with the remaining 1/4 C granulated sugar using a hand mixer. Beat on the low setting for about one minute. The mixture will begin to appear thicker and will slosh from side to side in the bowl. 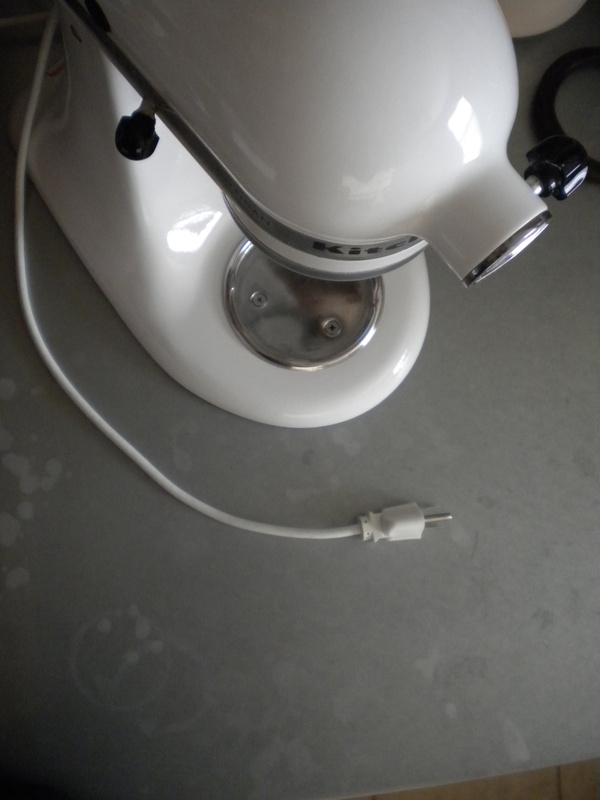 Increase the mixer speed to medium for another minute or two. The mixture will begin to go from extremely bubbly to frothy. 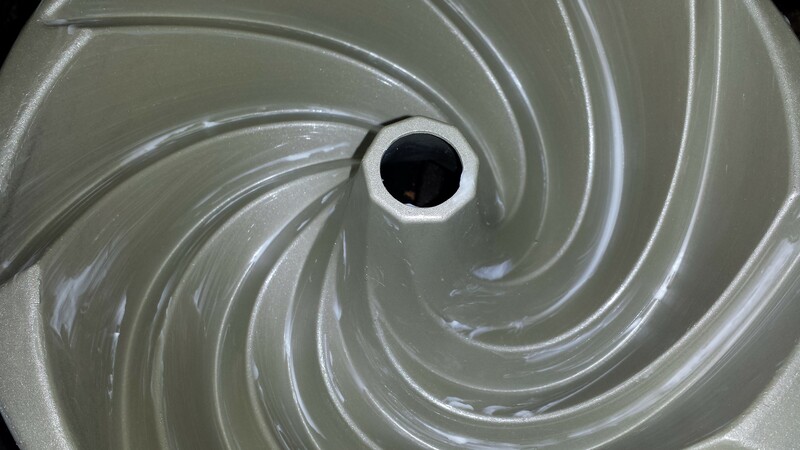 Once the mixture has is rippling, increase the speed to high until soft peaks form on the beaters when they are lifted out of the mixture (turn off before lifting out). Fold the meringue gently into the prepared batter and mix until incorporated. Mixing the meringue with the cheesecake batter, creating an amazing texture! STEP 5-A: Chocolate Marble Variation: Omit lemon juice and zest. Melt 2-3 ounces of unsweetened chocolate disks or squares over very low heat, stirring frequently. Remove promptly from heat as soon as the chocolate is melted. After the meringue has been folded into the cheesecake mixture, hold back about 1/3 of the batter in a medium sized bowl and gently stir in the melted chocolate until blended. Drizzle the chocolate batter over the original batter, which you have poured into the springform pan, and use a spoon or spatula to create swirls, or marble effects in the batter. STEP 6: Remove the crust from the freezer and pour the batter over the crust until the pan is full. Carefully put the pan into the oven and bake for about one hour, but keep an eye on the cheesecake to make sure that it does not over brown. The cake may crack, which is inevitable but will not hinder the flavor. If the temperature needs to be turned down, you can adjust it as needed and continue to check the cheesecake. It is done baking when a sharp knife (because it leaves no evidence of insertion) comes out clean. A finished product. Remember, cracks add character and depth of flavor! STEP 7: Allow cheesecake to cool completely. You can leave it in the oven to cool completely after turning the oven off if it has not browned significantly. A cheesecake needs to wait a full 24 hours before it should be cut and served. Allowing it to rest creates more complex flavor and texture. It is well worth the wait! The cheesecake can even be frozen for up to two weeks, after being wrapped well in foil. To cut and serve, loosen the clasp and gently wiggle the ring loose around the cheesecake. 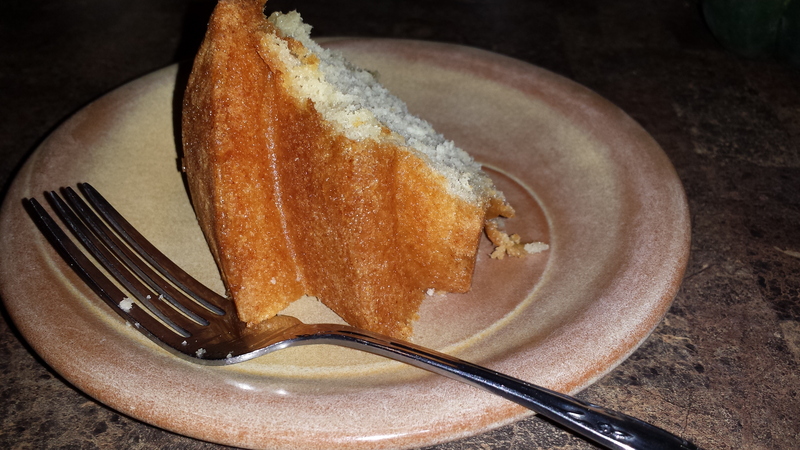 A spatula may come in handy to free the sides of the cake from the inside of the ring. 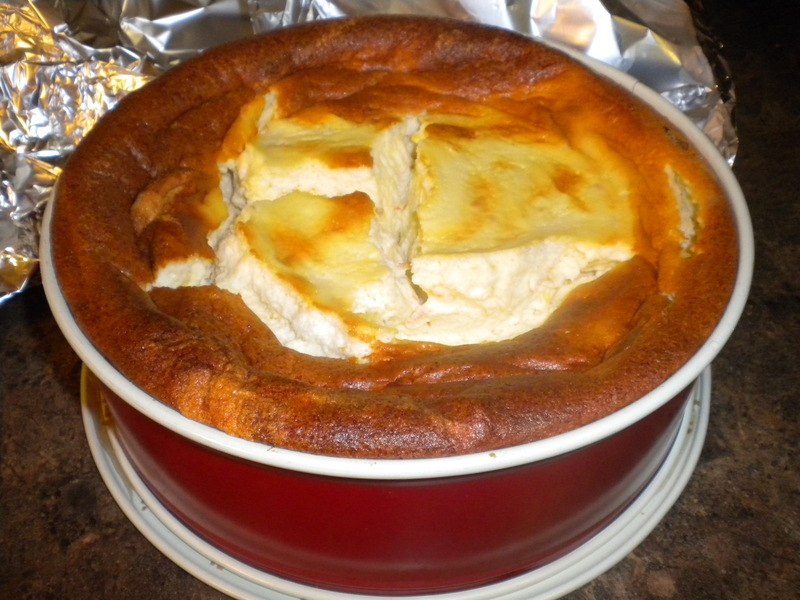 The cheesecake will remain on the bottom of the spring form pan, with the wax paper between the crust and the pan. When slicing, use a very sharp knife to avoid sloppy edges. The cheesecake will need to defrost for at least two hours if it has been frozen. Enjoy! This entry was posted in My Kitchen and tagged Baking and Confections, Cake, Cheesecake, cheesecake recipes, Cooking, easy cheesecakes, Fannie Farmer, Fannie Farmer Cookbook, Foods, Holiday baking, Home, Recipes, Simple cheesecake recipes on December 18, 2013 by Georgeann.